Maithripala Sirisena chose India as the destination for his first official visit abroad. Sri Lankan President Maithripala Sirisena arrived in New Delhi on Sunday evening to begin a four-day visit to India. Sirisena, who trounced Sri Lanka’s former president, Mahinda Rajapaksa, in a surprise election victory in early January, chose India as the destination for his first overseas trip as president. Sirisena, who is seen as a reformer in Sri Lanka, is scheduled to meet with a range of senior Indian officials to discuss strategic bilateral ties, trade, and investment. At a meeting with Indian Prime Minister Narendra Modi, the two leaders welcomed a “new beginning” in India-Sri Lanka bilateral ties. After a meeting with Modi and Indian President Pranab Mukherjee on Monday, Sirisena remarked that “relations between [India and Sri Lanka] will strengthen.” He added that over the course of his meetings, he and his Indian counterparts were “able to strengthen our friendship. We have already signed agreements on several subjects.” India and Sri Lanka signed agreements and memorandums of understanding (MoUs) on nuclear energy, cultural issues, education, and agriculture. The Hindu reports that the Comprehensive Economic Partnership Agreement (CEPA), an extension of the 1998 free-trade agreement between India and Sri Lanka, was not directly addressed during Monday’s discussions. India and Sri Lanka continue to have their differences. Notably, the treatment of Sri Lanka’s Tamils during the conclusion of the country’s decades-long Civil War has been a cause of concern for the Indian government. In recent years, the central government in New Delhi has come under pressure from Tamil legislators in India’s south to punish Sri Lanka for its wartime treatment of Tamils. This pressure led India’s previous prime minister, Manmohan Singh, to cancel a planned visit to Sri Lanka for the Commonwealth Heads of Government Meeting (CHOGM) in 2013. Sirisena, since coming to power, has taken steps to address the former government’s shortcomings on minority rights. Additionally, India and Sri Lanka have started working on the issue of repatriating Sri Lankan Tamil refugees who are currently in India. Additionally, India and Sri Lanka dispute the sovereignty of waters in the Palk Bay — the body of water that separates Sri Lanka from the southern tip of India. In recent years, Sri Lanka has taken to imprisoning Indian fishermen it says were caught fishing illegally in Sri Lankan waters. Shortly after his election, Sirisena released all Indian fishermen in Sri Lankan custody as a goodwill gesture. Modi reportedly broached the fishermen issue with Sirisena during his ongoing visit to India. One final area of concern for India is Sri Lanka’s relationship with China. Under Rajapaksa, Sri Lanka ostensibly was converging with China at a much greater rate than it was with India, to the concern of strategists in New Delhi. China, for example, has funded major port projects in Sri Lanka and Chinese naval assets have started making port calls regularly at Colombo. New Delhi saw Sirisena’s election as a positive event in this sense. Sirisena’s election manifesto contained thinly veiled criticisms of the Rajapaksa government’s approach to China and suggest a much more egalitarian approach to Sri Lanka’s foreign relations. However, in his first 45 days in office, Sirisena has been reluctant to burn any bridges with Beijing. Indeed, planned projects between Sri Lanka and China will go on without interruption. Sirisena has additionally announced plans to visit China after his India visit. Modi has been proactive about approaching Sri Lanka on increasing defense cooperation. He and Sirisena have reportedly agreed to expand India-Sri Lanka cooperation on defense and security issues. 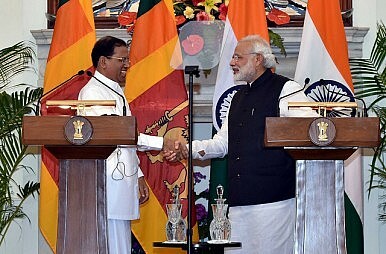 Modi additionally told the press that he and Sirisena welcome India-Sri Lanka progress in “maritime security cooperation, including in the trilateral format with Maldives.” As demonstrated by his election manifesto, Sirisena is aware of Indian sensitivities toward Sri Lanka’s rapprochement with China. Current trends suggest that cooperation between New Delhi and Colombo should grow on these issues as long as Sirisena is in charge.